The purpose of this guideline is to provide practical direction on improving local content and social outcomes through the procurement cycle: preparation, evaluation, execution and management of purchases. This guideline can apply to all purchases, from the identification of a requirement for a purchase order or contract through to the execution and variation of the contract. Organisations should implement the guideline and templates in conjunction with existing organisational policies and processes, while adhering to current legislative requirements. This guideline applies to all procurement personnel, with the assistance of stakeholders (especially contract owners), who are responsible for understanding and adhering to the requirements of this guideline as part of the overall procurement process. The first section introduces and defines social procurement, explains the need to prepare and align your business, and highlights the importance of strategic sourcing to achieve real outcomes. The second section provides an overview of the procurement cycle, providing social procurement tips, tools and templates. RFx Request for Quote, Tender, Proposal, Price (go to market) etc. G21 is the Geelong Region Alliance between Government, Business and Community Groups with an approximate regional population of three hundred thousand. G21 works acts as a forum to discuss regional issues across interest groups and municipalities resulting in better co-ordinated research, consultation and planning. G21 supports the delivery of projects that benefit the region across municipal boundaries and is a platform for the region to speak with one voice to all levels of government. The G21 region has a population of almost 300,000 people and covers 8972 square kilometres. It includes five municipalities: Colac Otway, Golden Plains, Greater Geelong, Queenscliffe and Surf Coast. GROW (G21 Region Opportunities for Work) is an innovative regional strategy which focusses on one of the key features of place-based disadvantage – joblessness. GROW aims to reduce unemployment in the G21 Region’s most disadvantaged areas over the next ten years. Social procurement is one of the four domains of GROW. It aims to generate social value from procurement spend to maximise job opportunities in target communities in the G21 region. Public, private and not-for-profit organisations around the world are increasingly realising the benefits available to communities through social procurement practice. Community support through youth scholarships, infrastructure for community use, fair trade programs, and the development of social enterprises, etc. Social procurement is also driving innovation and the development of new forms of partnership and service delivery models, while building job satisfaction, organisational pride and identity. By integrating social procurement practice into mainstream procurement thinking, organisations can build a competitive advantage and directly demonstrate their capacity to add social and economic value to their deliverables in a cost-neutral or cost-effective way. How do we define a social enterprise? A social enterprise is a revenue-generating business with primarily social objectives that reinvests surpluses in the business or community, rather than being driven by the need to deliver profit to shareholders and owners. These organisations are commonly referred to as social benefit suppliers and include social enterprises, Australian Disability Enterprises, Fair Trade Businesses, Indigenous Businesses, and can include women-owned and minority-owned businesses. Appendix A (LINK) provides a list of reference websites that may assist in identifying social enterprises. This guideline includes local small-to-medium suppliers (less than 200 Full Time Equivalent staff members) as social enterprises, due to their significant contribution to the local economy and community. An organisation may have an independent social procurement policy or include social objectives within an overall procurement policy. Procurement staff and key stakeholders must understand policy aims. It is crucial that the social procurement policy and strategy align to organisational leadership expectations and other departmental business plans. No single function or stakeholder group can make a social procurement commitment in isolation; leaders, contract owners, procurement staff and other key stakeholders are required to drive change. The size, complexity and current social procurement maturity levels will determine if some revisions and awareness campaigns are required or if your organisation needs professional development to build your social procurement framework. Use the following questions to test your organisation’s social procurement maturity. It is critical to analyse your spend and develop a strategic sourcing plan. The aim of the strategic sourcing plan is to identify early opportunities for local and social enterprise sourcing. The ‘Social Procurement Desk Top Opportunity Assessment Tool’ provides a list of categories where social procurement capability is generally more advanced and you should consider a direct sourcing opportunity or a sub-contracting opportunity via a Tier 1 Contractor. Your social procurement policy should provide guidance on the strategic sourcing options for your organisation. Using a sponsored supplier development program. Early identification of a suitable sourcing package and the best sourcing strategy is very important to investigating social enterprise tendering opportunities and enterprise capability. To help improve awareness and gain support the strategic sourcing plan should be visible to leaders and key stakeholders. The Strategic Sourcing Plan Template provides an example of the timelines and milestones to capture within a strategic sourcing plan. Larger organisations with complex procurement policies and thresholds should have a 12-18 month minimum sourcing pipeline. Organisations will typically have a significant percentage of their contracted spend allocated to multi-year arrangements. Do not wait for the complete contracting cycle before you introduce the strategic sourcing plan. Put social procurement on the agenda to cover targeted sourcing initiatives for already contracted strategic suppliers, especially those with a significant term left to run on the contract. The section on Contract Management (LINK) provides some high level guidance on managing a contract and potential key performance indicators. You should introduce social procurement and performance reporting as part of the regular contract performance review. Your strategic Tier 1 supplier likely manages and reports on local and social KPIs for other clients, and should adjust to this additional focus relatively easily. This is another great opportunity to work with Tier 1 suppliers on local priorities, and inform them of the strategic advantage for future sourcing if they adopt early. The following is an example of the types of contractual KPIs you could include in your contract performance schedule. You could introduce similar reporting and performance measures with your strategic or Tier 1 suppliers. Contract Management is critical to the success of any contracting outcomes and even more so for development of social enterprises. Social enterprises may require more support than an existing proven supplier may. The success or failure of a contract will often come down to an organisation’s contract management framework and Contract Owner capability. Providing suitable training and support will ensure you achieve your identified social outcomes. ˃ Linking social procurement to Corporate Social Responsibility (CSR), Sustainability and Victorian Industry Participation Policy (VIPP), and other internal performance tracking and reporting measures. Good social procurement policy is not enough to achieve improved social outcomes. The strategic sourcing plan will be critical to allow time to plan different sourcing options for the different categories of purchases. This guideline introduces concepts and processes that organisations can implement strategically and transactionally. Conducting a periodic (minimum annually), social procurement opportunity assessment and aligning to the strategic sourcing plan will allow an organisation to plan social procurement targets. This guideline summarises the procurement process into six main processes. Procurement processes and terminology vary across organisations, so this section will overview each key process from a local and social procurement priority, and provide practical tools and templates for organisations to adapt to their processes where necessary. The tools and templates have been hyperlinked within this guideline and are available on the GROW Social Procurement Website. The Social Procurement Guideline Model summarises the process flow. Using this flow will help increase goods and services procurement from social enterprises and implement effective contracts to ensure your organisation meets agreed social outcomes. The guideline aims to assist the end user to understand where they are in the procurement cycle and how they can apply or consider social procurement at that stage. Grey highlighting in the text below distinguishes the social procurement guidance, tips, tools and templates from the more general procurement processes. The Planning and Analysis stage has several key steps to ensure you are well prepared to go to market. Poor scope or design will normally result in poor delivery of goods and services or sourcing outcome, so one of the most important steps in this stage is developing a good scope. Do not confuse Stage 1 Planning and Analysis with the planning and analysis elements covered in Section A. Section A is about preparing your organisation for social procurement. This stage is about planning and analysis for a specific purchase. ˃ What are the expected deliverables and outcomes? ˃ What are we trying to achieve? ˃ What is the potential sourcing strategy (sole source, go to market, RFT, EOI)? ˃ Do we have social enterprises that could bid for this work or collaborate with a Tier 1 supplier if the scope is significant? ˃ Can a local supplier perform this work? ˃ Is the scope low risk and complexity and supportive of social procurement? ˃ Does the scope fall within one of the categories listed in Appendix A? ˃ Will this scope or project create new employment opportunities that align with the GROW objectives? Once an organisation has identified or clearly defined a procurement need, the end user or procurement representative can conduct a social procurement opportunity assessment using the Desk Top Opportunity Assessment (DTOA) tool. The DTOA helps the end user identify the suitability of the procurement need and social procurement opportunity. The DTOA provides guidance to assist the end user or procurement representative to consider their procurement strategy and what social procurement clauses to consider incorporating into the RFT. The social procurement clauses will primarily focus on delivering the key objectives of the GROW project to create employment opportunities in the targeted communities within the G21 Region and create increased opportunities for small to medium businesses. Large service categories or capital projects will likely create the most significant opportunities for employment and embedding key employment clauses within your tender will be critical to negotiating, awarding and implementing social outcomes. ˃ Is the SOW for the goods or services required written to an acceptable standard? ˃ Does the SOW or material list provide enough information for the bidders to submit an accurate proposal? ˃ Can you remove some low technical elements of scope and tender directly to a social enterprise? ˃ Does the SOW outline full technical specifications? ˃ Does the SOW outline expected deliverables, company obligations, contractors’ obligations, reporting requirements, and KPIs etc.? ˃ Does the SOW define the organisation’s obligation regarding travel, site amenities etc.? Definition – Benchmarking describes the standard, or a set of standards, used as a point of reference for evaluation, performance or level of quality. Organisations may draw their benchmarks from their experience, the experience of other firms or organisations in the industry, or from legal requirements such as environmental regulation. ˃ Are any other contracts currently in place for this scope of services? Is it possible to consolidate? ˃ Is current benchmarking data available? ˃ Is it necessary to engage a benchmarking supplier or industry body to assist with market data? ˃ Does a local or social enterprise trade in these goods or services? ˃ Have other organisations awarded similar scope to a social enterprise? ˃ What local and social employment targets have similar projects achieved? ˃ What are other organisations/industries doing in this area? ˃ Have we looked at new technology? ˃ Using the market dynamics Porter 5-Forces model what is the size of the market in relation to the number of vendors, the market segmentation, our relative size within that market and the competition level? ˃ What vendor cost/price drivers (currency, commodities etc.) exist? ˃ Where are the goods manufactured? ˃ What is the supply chain model and what parties are involved in the supply chain? ˃ What are the terms of trade? Definition – Evaluation Criteria describes a benchmark, standard, or yardstick against which accomplishment, conformance, performance, and suitability of an individual, alternative, activity, product, or plan, and risk-reward ratio is measured. Social procurement templates have been prepared that organisations can insert into existing evaluation templates to ensure appropriate weighting during the tender evaluation phase. You must document the evaluation process, including the weighted evaluation criteria and scorecard matrix, developed in conjunction with the Contract Owner, before you release an RFT. You should encourage input and ‘buy in’ from the end user or Contract Owner, as this will be the basis for selecting the preferred bidder. An organisation may have a policy that defines minimum social procurement weighting. This may vary depending on the value but should be a minimum of 10% for all formal RFT. Definition – The sourcing strategy describes the approach of the sourcing project. A sourcing strategy enhances the probability of a better sourcing outcome through improved planning and formal pre-approval by stakeholders. This is especially important where seeking support for a sole sourcing approach. Standard sourcing strategy templates have been prepared and contain the key input fields necessary to explain in any sourcing strategy. Sourcing strategies can vary from very simple summaries to detailed strategies, yet all should clearly define the local and social enterprise strategy. Sourcing packages will vary in the opportunity and target for local and social enterprise outcomes but internal stakeholders need to understand the sourcing team’s intent and evaluation process, especially if the preferred supplier does not have the lowest price but does meet local and social enterprise targets. Definition – RFT is a standardised process that provides a structured way for organisations and vendors to interact with each other and conduct business, often the exchange of specific items or services for a specific price, but also the exchange of information such as capabilities, willingness, commercial terms and conditions, or management plans of safety, ER and social outcomes. Organisations use RFTs to gather vendor pricing, capability and potential performance information to select the appropriate vendor(s) for the process. 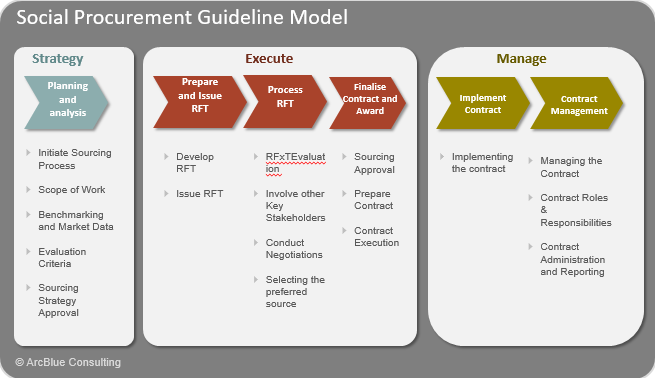 The RFT process culminates in vendor selection and recommendation to stakeholders. The procurement staff will typically prepare the go-to-market documents using standard RFT templates. ˃ What is the most suitable commercial structure for pricing purposes (lump sum, schedule of rates, full open book management fee, parts listing)? ˃ If labour based, do you need to issue a labour build up spreadsheet? ˃ Social Enterprise Development strategy to ensure employment and participation opportunities are available to social enterprises. In Process Section A, we define several sourcing procurement strategies to consider. Refer to Table 2 of Appendix A for a more comprehensive list of categories. It is important to remind the procurement team and internal stakeholders continually to identify these opportunities, especially if the organisation has not conducted, incorporated and embedded a comprehensive opportunity assessment into a strategic sourcing plan. Conflicting priorities often result in organisations overlooking social procurement sourcing opportunities. Standard Social Procurement RFT clauses have been prepared for organisations to consider including in their RFT depending on opportunity, value and risk. Evaluation templates have also been prepared to assess the supplier’s proposal and proposed commitments during the Process RFT phase. Both RFT clause and evaluation criteria have three levels of complexity so organisations can vary them depending on the opportunity. The following are two examples of social procurement tender clauses that you could select and insert into your standard tender template. In Stage 3 Process RFT (LINK) we review an example of a potential response and evaluation of the above two tender requirements. Depending on the value and complexity of your RFT, you may require a briefing once issued. RFT briefings are a great opportunity to explain to the bidders why your organisation is serious about social procurement and the process they should follow. It may be worthwhile to reiterate the social procurement intent, RFT weighting, evaluation process and the overall expectations i.e. we are not looking for high-level words but tangible commitments that can become contractual obligations. It may be worth suggesting where bidders can seek support to prepare their RFT, for instance, regional development groups, council, websites etc. The procurement representative collates the RFT responses and coordinates the evaluation process with the relevant site and business representatives. The evaluation methodology will depend on the nature of the goods and/or services you are procuring. The evaluation methodology should be transparent: you should select the preferred vendor according to the criteria contained in the RFT document (e.g. capability, safety performance, social enterprise commitments, and price). ˃ Undertaking a detailed technical evaluation in accordance with the agreed evaluation criteria for all short-listed bidders, to determine their capability, capacity and competency to deliver all requirements of the RFT. ˃ Conducting financial risk assessment for new vendors (or having the Finance team evaluate the new vendor’s past financial reports). Social Procurement RFT Evaluation Templates have been prepared with the same high, medium and low approach. Organisations can swap and change the evaluation criteria depending on the specific category and opportunity. You can incorporate each of the social procurement RFT evaluation templates into the overall evaluation template and adjust the percentage weighting. For the more strategic social procurement opportunities including larger projects, it is important to assess the supplier’s social enterprise commitments, past performance and current awareness in this area. A supplier who has performed and is currently committed to social outcomes is more likely to deliver successfully on any new contractual commitments. ABC Pty Ltd intends to deliver the majority of services with our current employees and will sub-contract Electrical Engineering Services elements to a local supplier 123 Pty. ABC Pty Ltd spent $2m dollars in FY14/15 on goods and services with 90% invested in businesses within the G21 Region. ABC Pty Ltd will use 5 existing experienced staff and propose to recruit 5 new local employees. Two of these employees will be recruited from less advantaged postcodes. In addition to the recruitment, ABC Pty Ltd plans to recruit two new apprentices to support the growth from this contract. The recruitment strategy will be developed and fully executed within three months of contract commencement. In the section Evaluation Criteria (LINK) we had determined the overall evaluation criteria, including social procurement and weightings. The following is an example of how the sourcing team or business owner may assess the response to tender schedule above. 3A Does the Bidder demonstrate capability and commitment to acceptable levels of local content (employment, economic development and value)? 20% 10.00 2.00 100% commitment to local content. Proven record of supporting and contracting locally. Only proposed sub-contracting is a local supplier. 3B Does the Bidder demonstrate capability and commitment to acceptable levels of local labour hours? 0.20 10.00 2.00 100% of current workforce is living within the G21 Region. Bidder has committed to recruiting 5 new local employees. Two of these employees will be recruited from less advantaged post codes. Bidder implementation timing is acceptable give this three year arrangement. As part of the evaluation process, there may be a number of stakeholders to be engaged to ensure the proposed commitments address all requirements of both parties in relation to the technical, financial, regulatory, HR/IR, HSE, sustainability and legal aspects. ˃ What is the market condition? ˃ What are we currently paying? ˃ What does our benchmarking tell us we should be paying? ˃ What are we prepared to pay to support social enterprise outcomes? ˃ What are we prepared to pay to support local outcomes? ˃ What are the minimum social enterprises, local content and employment outcomes we are prepared to accept during these negotiations? The gathering of market data and the development of reliable benchmarks play an important part of the negotiation process. Being aware of the inputs related to a vendor’s ability to source and supply materials and/or services will better provide the transparency required to identify negotiation opportunities with each submission. From a technical perspective, it is important that all submissions address the technical requirements of the request, so procurement staff can effectively evaluate ‘like with like’ and negotiate with vendors. ˃ Technical capability: does the vendor have the skills to do the work safely? ˃ Capacity: does the vendor have the personnel, systems and services available to do the work? ˃ Competitiveness: is this the best cost-to-business benefit? ˃ Commercial viability: what is the ‘Total Cost’ of the offer? ˃ Overall alignment: what are the vendor’s charter values, community values, commitment to E-business etc.? Once the evaluation has determined a preferred vendor, the procurement lead must coordinate the necessary internal approvals. Any new contract or amendment may require a Recommendation to Award (RTA) subject to your local business rules. The RTA document sets out the requirement for the goods or services contract in question as well as detailing the sourcing process undertaken and the justification for selection of the preferred vendor. It also includes detail on the evaluation methodology and any operational, commercial or legal issues dealt with during the evaluation phase. To ensure ‘buy-in’ to the contracted targets including social procurement outcomes, various leaders including the Contract Owner and Supply Managers must be involved in the approval process. You should dedicate a section of the RTA Template to social procurement outcomes. This section will define the negotiated social outcomes and become contractual commitments. In preparing the contract, the contract terminology must be clear and concise regarding scope, with respect to inclusions/exclusions, and the price review mechanism and frequency, which eliminates the risk of disputes at a later stage. The contract may require a clause to be included to cover social enterprise commitments. The clause could be as simple as the percentage or contract value of local content or several contractual commitments submitted and negotiated during the RFT. The contractual commitments will also form the basis of your performance reviews and reporting requirements. Include social procurement KPIs in the performance schedule section of the contract so it is clear what you will review as part of managing the contract. Suggested social procurement KPIs and tips on how to manage the contract are summarised in section Contract Management (LINK) of this guideline. Once you have obtained internal approvals, you can issue the final contract draft for execution in accordance with your organisation or legislative requirements. Once signed, scan the contract and/or variation/amendment into PDF format and store in accordance with your local policies. It is important to advise unsuccessful bidders why they were unsuccessful. The evaluation tool is the most useful source of information for this. A supplier, especially a small enterprise, needs to learn from the process so they can address any shortfalls. An RFT debrief is a great opportunity to reinforce local and social enterprise content if this was one of their low weightings. The contract implementation phase is not just the physical mobilisation of a contractor’s workforce and equipment but also the alignment with safety, industrial relations, social and contractual requirements. The mobilisation phase is about developing an understanding between your organisation’s stakeholders and the contractor on important contract management issues. While implementing any system related changes, develop the implementation plan for the contract with the supplier and other stakeholders, to ensure a successful transition phase to the new agreement. This may involve regular meetings and reviews to identify potential downstream issues related to the implementation. If the contract is replacing a current contract, the above mobilisation plan will need to work in conjunction with the demobilisation of the incumbent. Take particular care in transitioning the contracts with familiarisation of the service for the incoming vendor while the incumbent is finalising the service. Post the internal approvals and contract award, the sourcing team should consider the communication strategy. This may involve a more formal contract signing process to increase internal and external awareness of the targeted contractual outcomes. ˃ Embedding a contract management footprint to deliver best practice. The objective of any contract management framework is to give a clear understanding of the contract management process and accountabilities. An organisation’s contract management policies may cover requirements relating to managing contracts, and define the types of contracts that require performance management, the methods available for managing contracts, the rewards and recognition relating to exceeding contract expectations and the responsibilities of all parties involved. The primary need for a contract review is to evaluate the progress and performance of the contract against the contract intent documented in the SOW, commercial terms and conditions and HSE Plan. Reviewing the executed contract on a regular basis is a crucial step in contract management and is required to maintain contract compliance. There are several methods to review the compliance of the contract. The most conventional is the Quarterly KPI review, however depending on the type of contract, the Quarterly review may be too frequent or not frequent enough, so an organisation may implement a Tier rating for frequency. Below is a table suggesting the frequency of KPI review. Outside the KPI review, there are several other contract reviews required to maintain compliance as documented below. Note this table is a suggestion only; potentially high-risk T1 contracts with frequent reporting, or extremely volatile spend contracts may require monthly KPI reviews at the contract owner’s discretion. The frequency of KPI reviews for T2 or T3 contracts will also depend on these factors. The content of the KPI review will follow required measurable points of the SOW, terms and conditions or HSE plan. A KPI sheet cannot include KPIs that contradict the contract documentation. A KPI sheet should not contain more than 15 KPIs. Each KPI needs to contribute to a value adding measure that you need to track to maintain the compliance of the contract. Do not add KPIs just to make up numbers. The contract owner should determine who attends the contract review. Too many non-contributing attendees can disrupt the meeting from achieving contract-related results. Contractor KPI presentation must follow the format of the KPI sheet, fully explain, and justify the score proposed with required back up slides as required. We recommend the contractor send through the presentation prior to the meeting so the contract owner can review the presentation and give the vendor the opportunity to correct any obvious errors to eliminate wasted time during the review. You must minute all Contract KPI reviews. Minutes must capture the attendees and actions arising through the review on the presentation, or KPI scores. We recommend you review the previous meeting minutes before the presentation begins to ensure all previous actions has been completed and is reflected in the current KPI presentation. On completion of the KPI review, you must send the final agreed KPI score along with meeting minutes and all KPI review documentation to the procurement team for electronic filing according to your local policies. The following table provides a summary of potential KPIs you might consider when drafting the schedule for the contract performance review, or as part of an existing contract management framework. ˃ What the person must escalate, and to whom, to ensure that they do not introduce risk to the contract or organisation. Continual monitoring and review of the contracts base ensures optimal sourcing opportunities are realised. The process involves the review of existing contracts in relation to validity of dates, off-contract spend, variations and random audits in relation to the vendor’s performance and risk reduction. It is the Contract Owner’s responsibility to administer the contract. You should understand who is responsible for coordinating social procurement reporting and governance internally. A dashboard may be required to capture data and update performance. Leaders must clearly define roles and accountability for reporting and governance in addition to the procurement and Contract Owner roles. How are we trending against internal targets? How does our reporting align with sustainability, CSR or VIPP requirements? ˃ Whether the organisation can promote contractors to support each other through strategic sub-contracting. Contract Management is critical to the success of any contracting outcomes and even more so for development of social enterprises. Social enterprises may require more support than an existing proven supplier may. The success or failure of a contract will often come down to an organisation’s contract management framework and Contract Owner capability. Suitable training and support ensures the organisation achieves the social outcomes identified through the strategy and process.